Betty Taylor was a prominent member of the Irish Pacifist Movement (IPM) which began life as the Irish Anti-War Crusade in 1936. 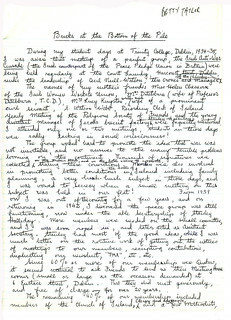 These are notes dating from February 1978 which she contributed during research for an article on “Peace groups since the ‘thirties” which appeared in the “Nonviolence in Irish History” pamphlet produced by ‘Dawn’ magazine that year; they were not intended as a finished article. The text of the pamphlet is available at www.innatenonviolence.org/pamphlets/nonviolence.pdf and the “Peace groups since the ‘thirties” article is on page 32. 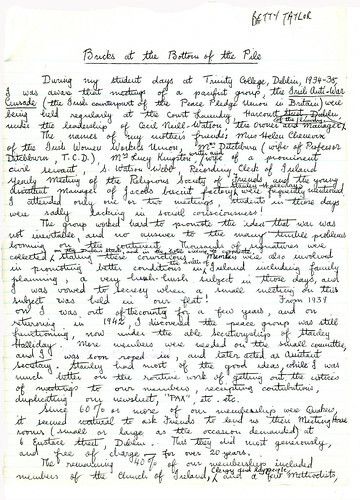 There are six pages of Betty Taylor’s notes.